Since the relationship between Thomas Jefferson and Maria Cosway has been mentioned in a previous post, I thought it would be enlightening to include a letter written by Cosway to Jefferson. It provides some insight into the nature of their relationship and the qualities she possessed which must have appealed to Jefferson. She wrote this letter, received 8 January 1787, after she returned to England in October 1786. It was in Italian and has been translated into English. I have awaited with infinite anxiety the long letter which you announced to me, but I do not know for what crime I must experience the punishment of Tantalus, every day I believe it near, but that day never comes; in your last letter of a century ago you tell me you have received one letter of mine, I have written as many as three of them, as I recall, all directed to the banker [Ferdinand Grand] according to the address which Mr. [John] Trumbull gave me. The loss is mine, because it deprives me of those moments which you sacrifice in reading my letters, I recall myself for a few instants to your memory, and it justifies me in the desire which I have to pay you my compliments and to offer you those attentions which you so well deserve through your kindness and friendship for me; and what concerns me still more you do not tell me how you are, whether your arm is cured, [Jefferson had broken or dislocated his wrist, perhaps in a showoff maneuver on one of their walks] whether you have received a book of music which I sent you some time ago * * * Here are subjects enough for you to fill two lines, whose import is of interest only to me and which you may write to please me. I am the worst person in the world for sending news since I never enter upon that subject; I am sensitive to the severity of the season; to this unpleasant climate, and to the melancholy of this country; perhaps it seems more severe now, after the gay months I spent in Paris where everything is gay, I am susceptible and everything that surrounds me has great power to magnetize me. If I am more endowed by nature with any one sense, it is that of melancholy, according to the objects which surround me, it may be dissipated or increased. Such is the influence upon susceptibility. I am surrounded by amiable persons, friends, and everything that is flattering, I spend more time at home and I may say that pleasures come in search of me, because I do not go hunting for them elsewhere. All day I paint, and exercise my fancy on anything which it points out, and such is the pleasure in painting when one is free to follow only when desire inspires us; the evening I generally spend in practicing music, and a charming society makes the harmony perfect, and both unite to produce the true pastime. I have not been to the opera, but I hear that it is bad, I never go to the theater, and I take more pleasure in declining every other pastime and engagements, than in accepting them. But for what does all this preamble serve, when I began I intended to say only two words, to confess the truth I wish to hold myself to your example; I do not wish to erase what I have written because I am grateful for the pleasure which it has brought me in conversing with you, but I wish to be cruel to myself and mortify myself by depriving myself of continuing further and finish by assuring you that I am always with the same esteem and affection your most humble servant and true friend. Note that Jefferson asked her not to write to him directly but in care of Ferdinand Grand. FYI—John Trumbull, an artist and friend of Jefferson’s, had introduced him to Maria Cosway. Jefferson wrote fifteen letters to Cosway between October 1786 and June 1790. 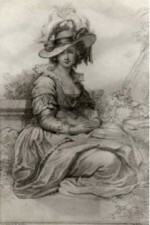 Maria Cosway wrote Jefferson twenty-two letters during the same period. Though their paths crossed in Paris again, they never resumed the intimacy of the time they spent together from August to October 1786. The source for this letter can be found HERE. The Cosway engraving can be found HERE.